The Nabtesco Group recognizes its social responsibility for realizing a sustainable society. We formulated the Environmental Philosophy and Environmental Action Plan in May 2005 to promote activities in a Group-wide manner. At all times, we acknowledge the impact of our business activities on the global environment; we strive to create products and an environment which are both peoplefriendly and nature-friendly; and we aim to achieve a future society which is enriched and comfortable. We acknowledge that the preservation of the global environment is a crucial issue that is common to humankind. With participation by all employees, we will actively promote the establishment of targets which aim to improve the results of our environmental preservation activities, and we will actively promote initiatives for sustainable improvements. We will strive to improve energy, resource and recycling efficiency during the planning, development and design stages of each product by understanding the impact on the environment throughout the life cycle of the product. We will strive to reduce the burden on the environment during the production, sales, distribution and servicing of each product by actively employing or engineering advanced environmental technology, such as for the conservation of energy, the effective use of resources and meeting the challenge of zero emissions. We are committed to voluntary activities designed to realize environmental targets. We will comply with environment-related laws and regulations, as well as with social norms, and we will set independent control standards as necessary. We will actively promote exchange and links with society, and strive to gain wider understanding and trust through such action as the disclosure of environment-related information and participation in social activities. The Nabtesco Group has set up the Group ESH Committee as the promotional organization related to the environment, safety, and health. We promote environmental management under this committee, which directly reports to the CEO. (The meetings are held at least once a year. The Environment & Safety Department serves as the secretariat for the meetings.) The chairman and the other members of this committee are selected from among officers including directors. 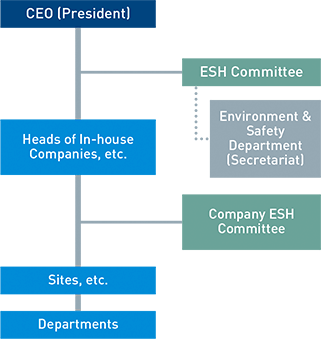 The Group ESH Committee collects important information on the environment, safety, accident prevention, health, and others, including climate change-related risks and opportunities; assesses the materiality of related issues; and discusses measures for issues that are deemed to be important. Based on the results of the discussions, particularly important issues that might have a serious impact on the Group’s business are reported to the Management Committee, which discusses important matters related to execution of business, and reflected in formulation of business strategies. The chairperson of the Group ESH Committee visits each site once a year to carry out an ESH audit that includes checking the results of ESH activities. Instructions are then given based on the results of the audit. The Group ESH Committee summarizes the reports about the results of the ESH activities, including the audit results. They are reviewed at the Management Committee at the end of each fiscal year and reflected in the activities in the following year. Results of the FY2017 ESH audits are summarized below. Key guidance provided based on the audits includes the formulation of more environment-friendly plans. Activities for building a system for ESH management of overseas Group companies have also been started. We are creating documents on rules and records and introduction of tools for managing environmental information, with an aim to visualize the operations and improve their efficiency. In FY2017, ESH audits of eight Group companies in China were started, with an aim to prevent violation of laws and regulations and maintain and improve achievements of ESH activities. The ESH audits are planned to be expanded into business locations in other regions from FY2018 onward. The Nabtesco Group acknowledges that the ISO 14001 international standard is an effective tool for environmental management and therefore uses it in building and operating our environmental management system. Since the Konan Plant (Automatic door business) in Japan first obtained ISO 14001 certification in October 1999, all Nabtesco Corporation plants, as well as five six major Group companies (Over 70% of sales), have become ISO 14001 certified. With regard to domestic Group companies that have not yet obtained ISO 14001 certification, we check the status of activities and management during the ESH audit. We also began to carry out similar checks of overseas Group companies including ones in China, one by one, in FY2016. The Nabtesco Group is aiming to establish a system that integrates ecology and economy and is also working to maintain consistency and alignment in our environmental activities across the entire Group by promoting information sharing and collaboration among our sites and Group companies. Moreover, in order to improve the results of our activities in a sustainable manner, we incorporated the indicator of environmental objective (reduction of CO2 emissions) achievement ratio into the performance evaluation of business departments in FY2017. The Nabtesco Group provides its employees with diverse environmental education to raise their environmental awareness. For the environmental education to new employees, we show them the content and achievements of the company’s environmental activities, and emphasize that every small activity of each employee will eventually result in a great stride in the reduction of our environmental impact. We also organize ESH trainings and energy saving committees for ESH managers and those in charge of ESH at each site to share such information as the latest ESH-related trends and revisions of important laws and regulations. At the Nabtesco Group, we identify, register, and manage environmental laws and regulations applied to our business. In addition, we prevent violation of the laws and regulations by regularly confirming that the registered information is the most recent. If a violation should occur, we report it to the Chairman of the Group ESH Committee by following specified reporting procedure and format, which enables prompt response. In FY2017, there was no violation of environmental laws and regulations. 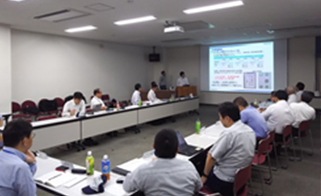 The Nabtesco Group has been participating in various organizational activities related to environmental conservation including the United Nations Global Compact Network Japan's study group on environmental management. In this study group, we collect information from NGOs and experts and share information and have discussions with a wide range of companies, including those in other industries, under the themes of climate change, water-related risks, biodiversity, energy and others. Through this type of proactive collaboration and dialogues with external initiatives, we collect information about advanced initiatives and other information in order to enhance our own environmental management.